February may be the smallest month of the year, but I managed to pull off two huge trades during it. The first to arrive was my second with Trading Card Database member Sportzcommish in a matter of two weeks. This one was much larger, however, and the first trade I've completed using the Database's Alerts system. They installed that recently where you can set it to notify you when a card you are looking for is added to somebody's trade list, and I posted some that he wanted, so a large trade was made- almost 150 cards going in each direction! Now, since he's mostly a football guy moving into basketball, and I'm the kind of guy who will accept literally anything in trade, most of what he sent me was football, but that's OK because I was able to add 43 new people to my collection in that trade, including some people that this non-football fan has actually heard of, namely Joe Greene and Vince Lombardi. I also got my first Joe Gibbs football card, which now moves him to the multi-sport section (I have about 40 cards of him from NASCAR). In total, I got 122 new cards in this one trade. He did happen to have one NBA card I needed, too...believe it or not but I still have not completed this insert set! 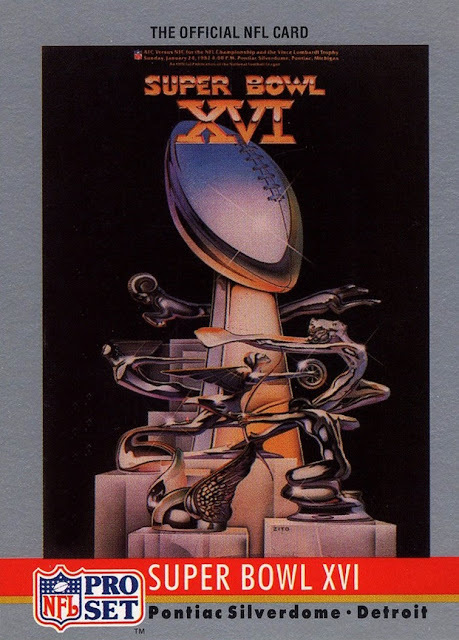 Here are some of the football, one from each set I got cards from except for 1989 Pro Set which I forgot to scan. 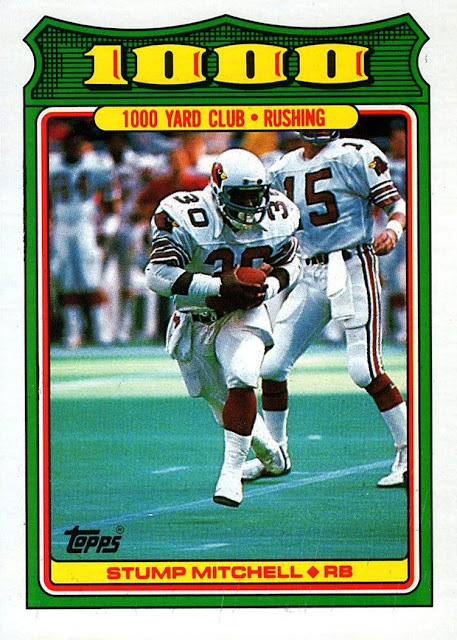 I actually had a bunch of these first two years' of 1000 Yards Club, so I now have some duplicates, Like I said, I will trade for anything! Various hood ornaments surround the trophy, very cool. My automotive reference book starts at 1940 so I don't know if they all come from Pontiac designs or not. 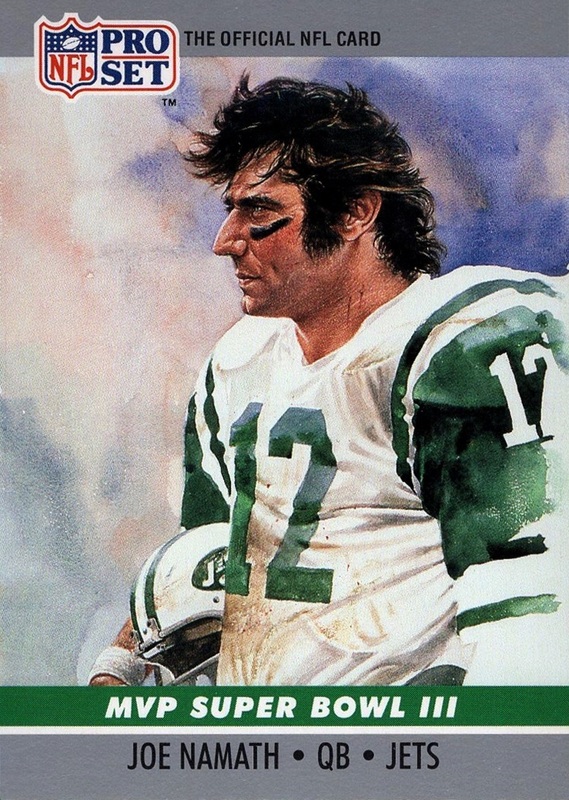 My mom actually knew Joe Namath back in the day. Maybe she will post the story in the comments. But is he faster than lightning? This last one, from 1990 Topps, is my favorite design as it utilizes green and yellow extensively. They are my two favorite colors, green always has been, yellow has joined it recently. The second trade I received, just a day or two after the first one, was also on the Trading Card Database, with SaveDaKid, and was all NBA. I have not processed them into my collection yet so no scans but take a look at this slide of cards. 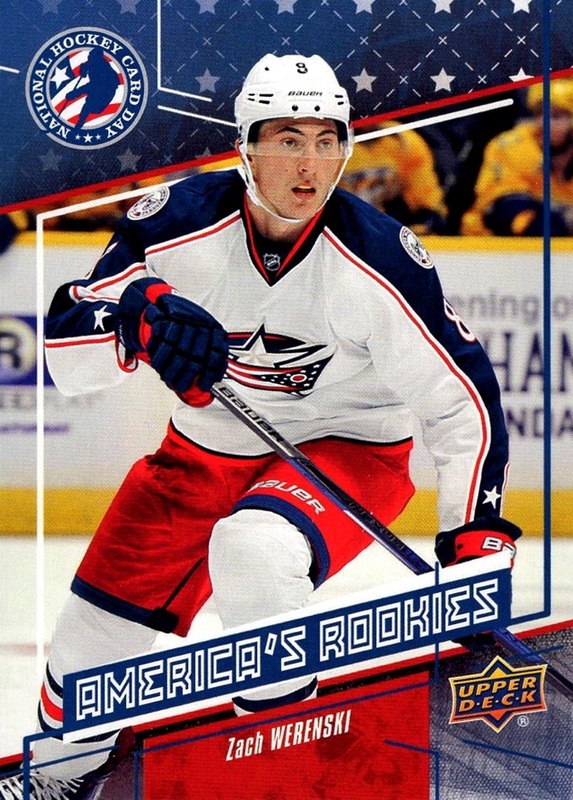 Most of it is all 1990s goodness, though the trade does go up to the 2012-13 season as well. I added somebody who was nearly a One Hit Wonder (he only got one NBA card, but it had a parallel) and I completed the 1995-96 Fleer Flair Hardwood Leaders insert! 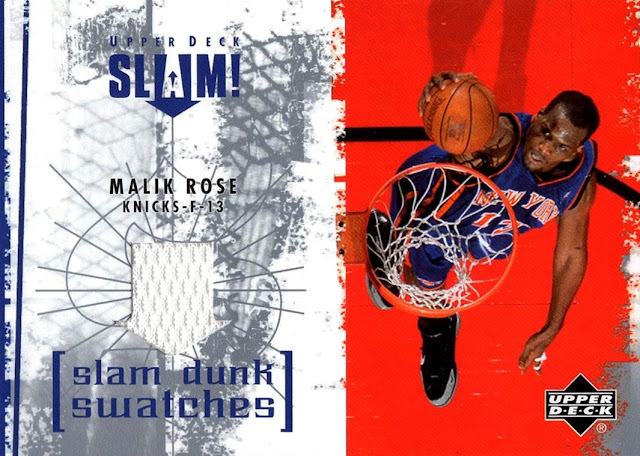 That was a one-per-series 1 pack in 1995-96 Fleer flagship, the first NBA set ever to enter my collection, so any time I can complete an insert from that set is a big deal. I really want to build the Master Collection for that set. I've already completed the base and several of the inserts so it's not outside the realm of possibility. Unfortunately for me every single one of the cards in the trade was already scanned and posted to the Database, leaving me very little to do with my new additions...although eventually I will scan them for my own website and possible blog posts, but for now the majority of them will be put into the "Scan Later" boxes which is where I put all the cards already done to the Database....which I will scan when I finish scanning everything that isn't yet posted. Or sometimes I just feel like scanning some 1990s cards so I pull out some and do them anyway, lol. Even so, I'm always thrilled to get new cards, especially cards from the 1990s, so it was a great trade. Thanks for the trades, and for reading! The Special Paint Scheme I've chosen to highlight is again from the 1995 season, and one of my all-time favorites. This car was run for three races, beginning with the Coca Cola 600 at Charlotte, just one week after the silver #3 highlighted was run, then skipping Dover and appearing in Pocono and Michigan. 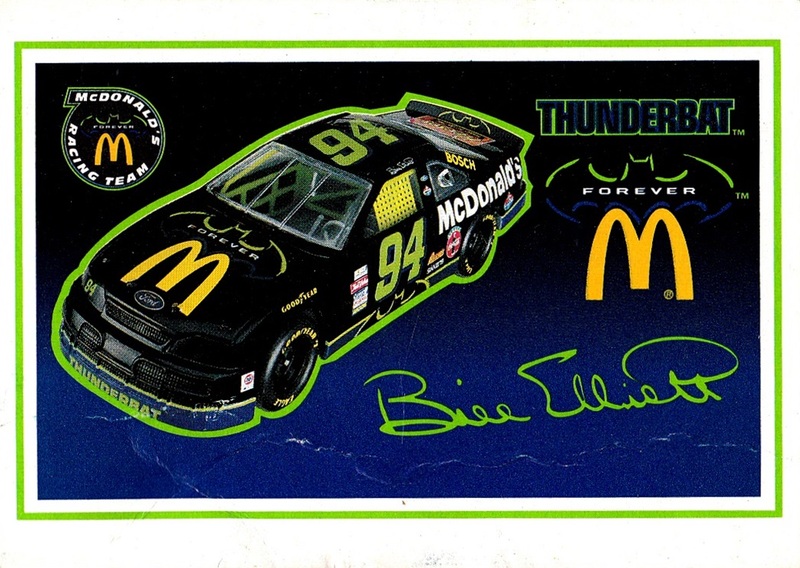 It was the first paint scheme to promote a movie, in this case Batman Forever. 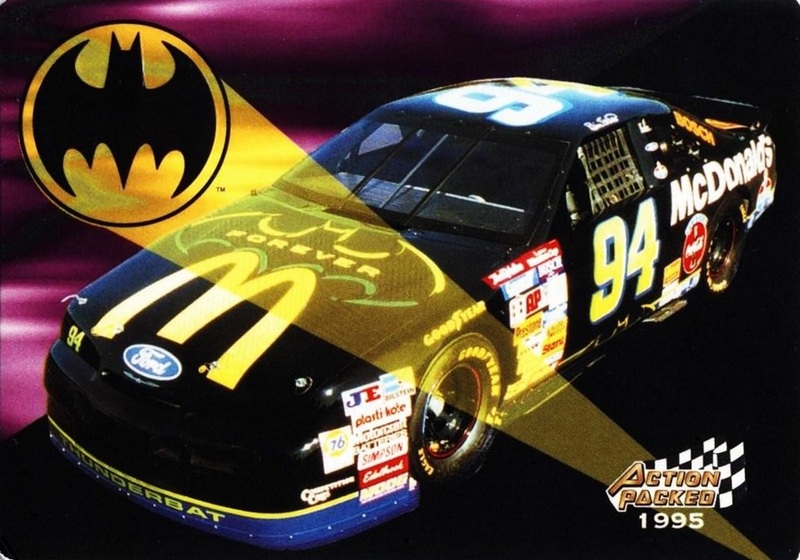 It was the first time DC Comics properties ever appeared on a race car. As a lifelong DC reader I thought that was pretty darn cool. The best result for the car came at Pocono where Elliott finished 6th. A crash at Charlotte relegated the Thunderbat to 39th, and Michigan saw a finish of 14th, a lap off the pace. The car was fairly popular on cards. 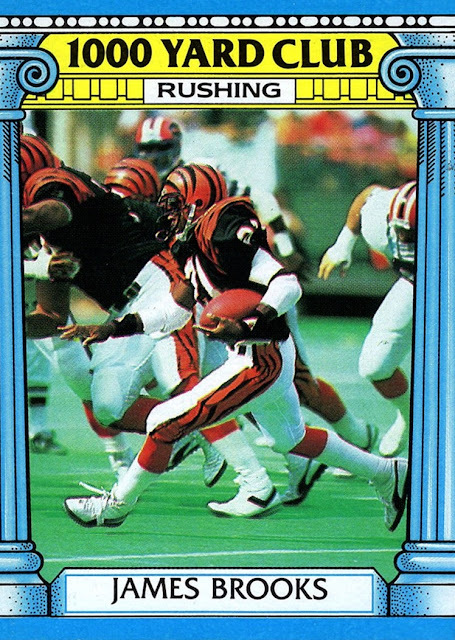 It appears on at least 14 cards- the one shown, two more from the same set, the Racing Champions card, and a 10-card "Bat Chase" insert from 1995 Maxx. Unfortunately none of the Bat Chase cards appear in my collection, but I do have the Racing Champions card and the Action Packed cards, shown below. Action Packed issued three sets in 1995, this one is the Winston Cup Stars set, which was I believe the final release of the year. 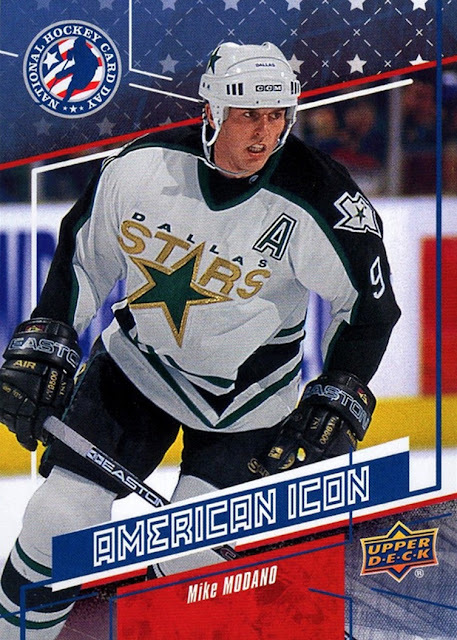 While I was collecting at that time, I don't remember anymore for sure if the Stars or the Winston Cup Country set was the last one released during the season. The third set is the Preview set, which obviously came first. Note that the car in the photo is lacking roof rails. That's highly curious because they have been mandated to be on all cars sine the 1989 season. Since this one was in 1995, it should have had them. I don't have an answer for that one. This was the second time that Ford had allowed one it's teams to change the name of their Thunderbird. In the final race of 1992, Alan Kulwicki removed the T to make the "Underbird" to celebrate his underdog status (he won the title that year by 10 points over Elliott). This time they allowed the Thunderbird to become the Thunderbat. The usual bright red and yellow McDonald's colors were changed to black and dark blue with green accents for this special event. The McDonald's sponsorship would lead to many special paint schemes, Elliott would run several every year until 2000, the last year they sponsored him. Currently sponsoring Jamie McMurray, they have already run a special paint scheme in 2017! 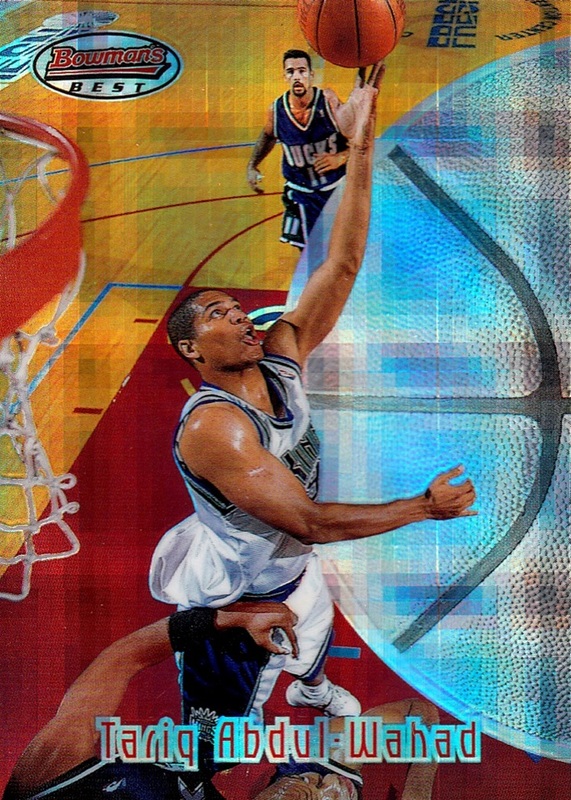 The other Action Packed cards are lenticular and don't really show the card in scan, but you can see it in hand. The Racing Champions card shows a photo of the 1/24 diecast, as shown below. Although the car in the Action Packed card appears to have a black interior, and the Racing Champions issue has green, the real car raced with the standard red interior. The Maxx Bat Chase cards show actual race photos, at least on some of the 10 cards. I'd like to hunt them down at some point. Thanks for reading, March's post will not be from the 1995 season, although I have not determined which scheme to highlight yet, these were the only two of the season so the proverbial well has run dry for 1995. I'm posting this during this year's Daytona 500. The Truck race was decent, the Xfinity race was actually very good, here's hoping that the Daytona 500 itself will be a good one also. It's the 25th Daytona 500 I've seen live (on TV), all consecutively, so that's a bit of a big deal to me. I've seen 1986-91 as well but a copy of the 1992 race still eludes me, I've never seen that one. 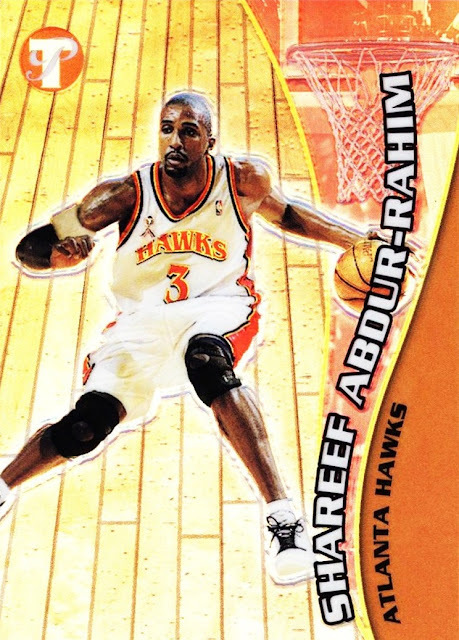 For the second installment of the NBA Encyclopedia, I'm backtracking a bit and stepping forward a bit to showcase ten players who have changed their names during their career- and have cards of both names in my collection. They will be sorted by the new name they have chosen for themselves, not their original name. Born Donald Smith in Brooklyn, NY, he changed his name to Zaid Abdul-Aziz according to Wikipedia in 1976, although I am dubious to the correctness of that as he appears under the name on his 1975-76 Topps card, shown here. 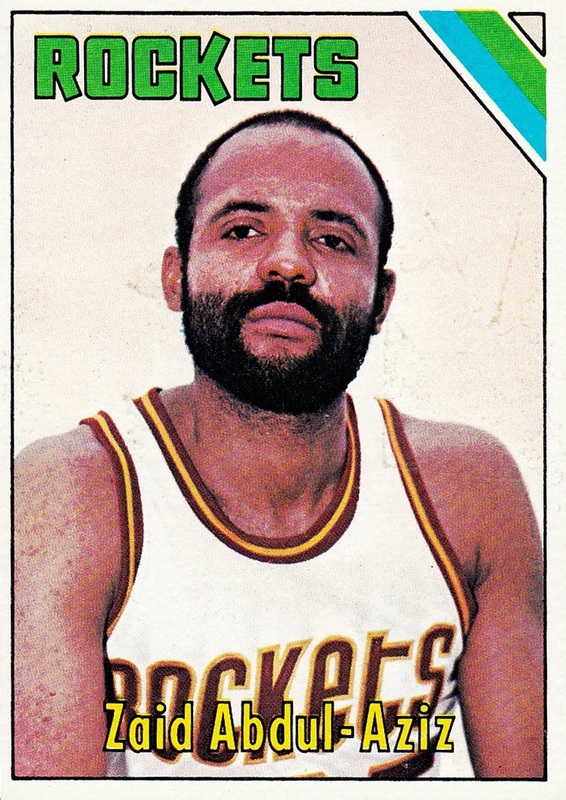 He played 505 games over 10 seasons in the NBA, beginning in 1968-69 through 1977-78. He played for the Royals, Bucks, Sonics (twice) Rockets (twice), Braves and Celtics. He led the NBA in Rebounds per game in 1973-74. 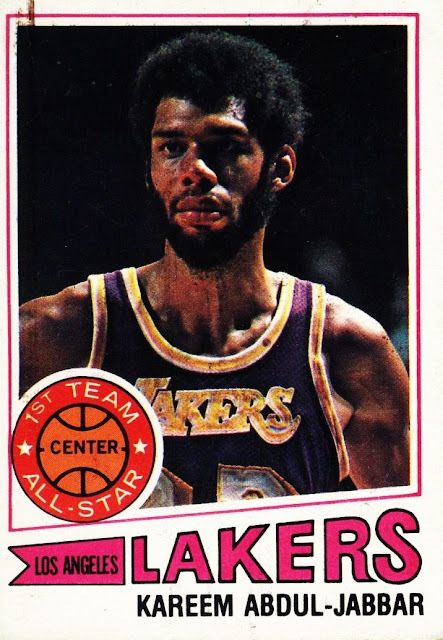 One of the all-time greatest players in NBA history, the accolades for Abdul-Jabbar are tremendous. He's the NBA's all-time leading scorer with 38,387 points scored over 1,560 games between 1969-70 and 1988-89. He was an all-star 19 of his 20 seasons in the NBA (missing only 1977-78), 6 time MVP, 11 time All-Defensive, 15 time All-NBA, NBA Rookie of the Year, one of the NBA's 50 Greatest Players, and a Hall of Famer. To this day he is the all-time leader in minutes played, shots made and attempted, and personal fouls committed. He ranks second in games played, third in total rebounds and blocks and 10th in free throws. He also ranks 41st all-time in assists, which during his career era was not the forte of centers. (they were getting the ball, not giving it). 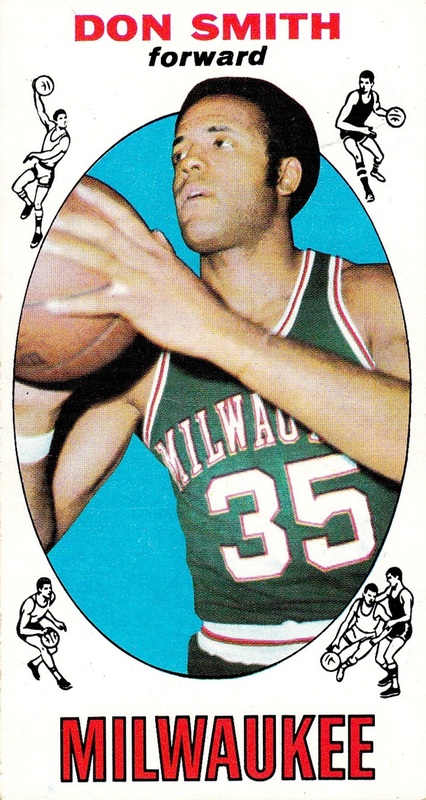 He scored 5 NBA championships with the Lakers and one with the Bucks, the only one in Milwaukee franchise history. 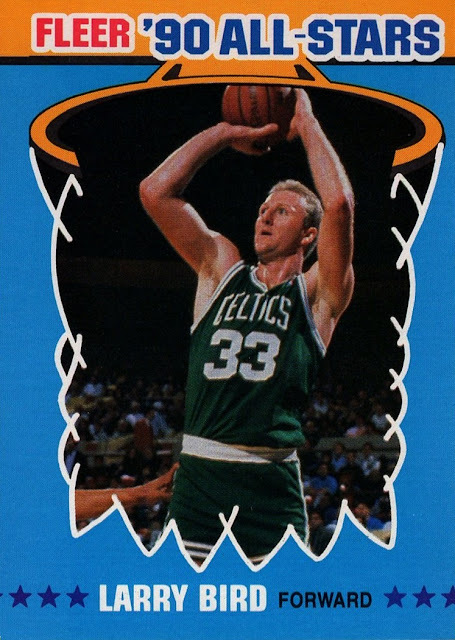 For the majority of his career he was a player that most teams dreaded having to face, because it was known by all that he was going to be nearly unstoppable on the court. About the only thing he did not do was three pointers- he made only one in his career. He is from New York City. Unlike most players who adopted the Muslim faith, he continued to use both his names during his career. Born in Wilmington, Delaware, he is the first player alphabetically to no longer be alive, passing away in 2011 at age 69. 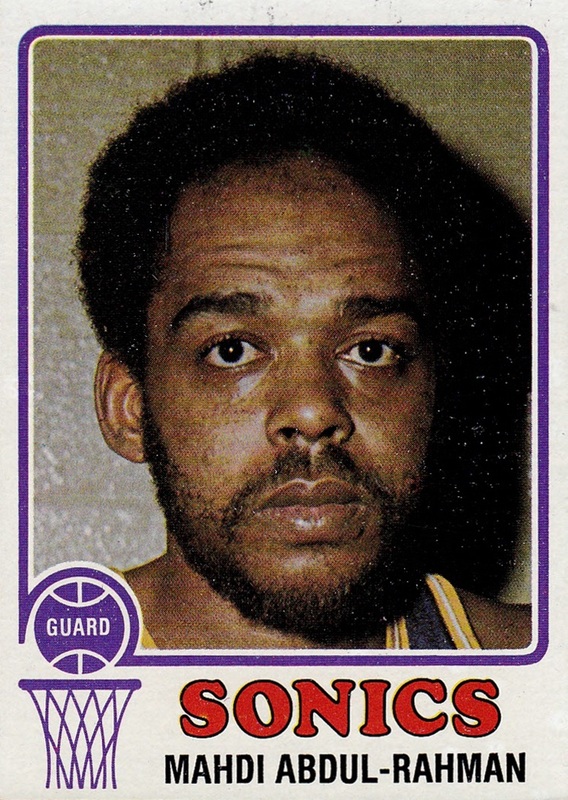 He played 724 games in the NBA from 1964-65 through 1973-74, playing for the Lakers, Sonics (twice), Hawks, Braves and Warriors. 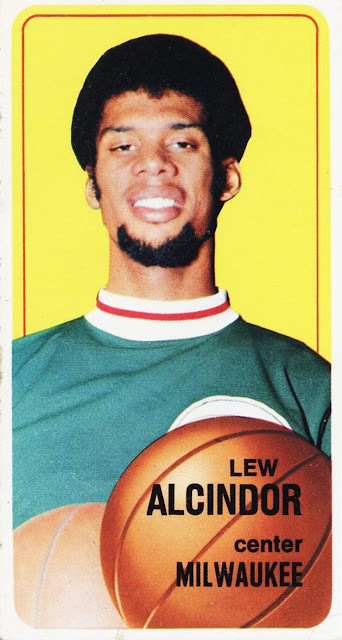 Taken by the Seattle SuperSonics in the expansion draft, he was an All-Star in the club's first season of 1967-68. 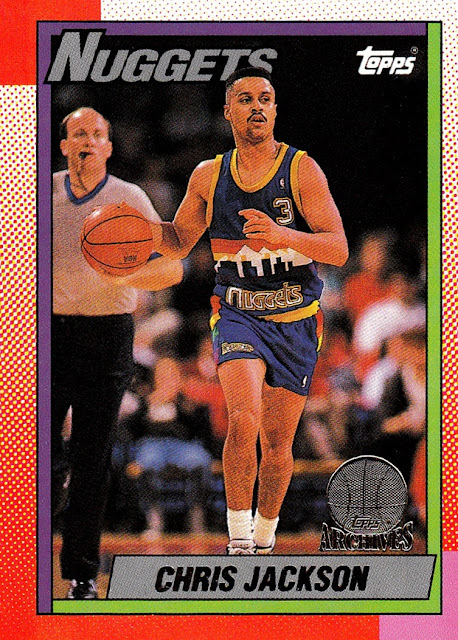 Born Chris Jackson in Gulfport, Mississippi, he changed his name to Abdul-Rauf between the 1992-93 and 1993-94 seasons. 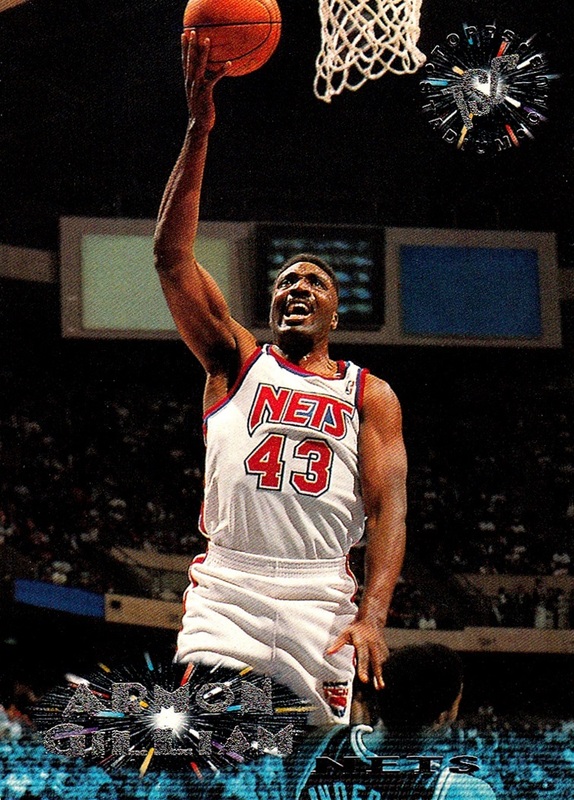 He played 586 games over 9 NBA seasons, beginning in 1990-91. He was out of the NBA in 1998-99 and 1999-00, before making a one-season comeback with the Vancouver Grizzlies in 2000-01. 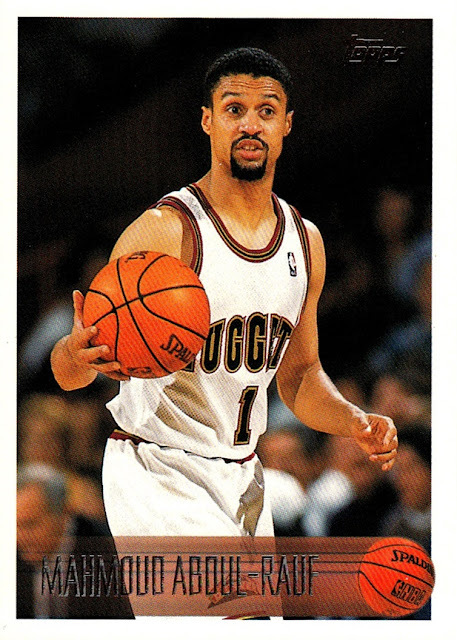 He previously played for the Nuggets and Kings. His sole career accolade was winning the 1992-93 Most Improved Player award. I do not have any cards with his original name scanned yet, but he did not play any games under his original name, so I chose to include him now anyway. 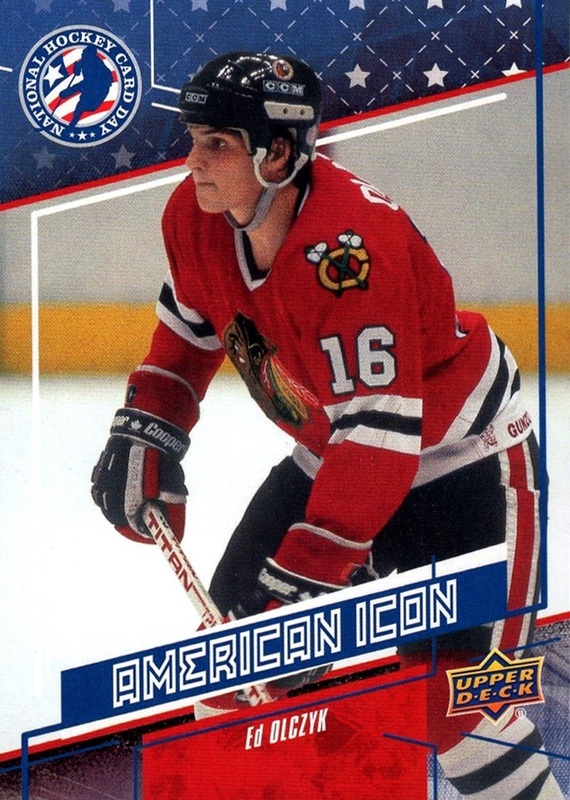 He changed his name between the draft and his first season of 1997-98 began. 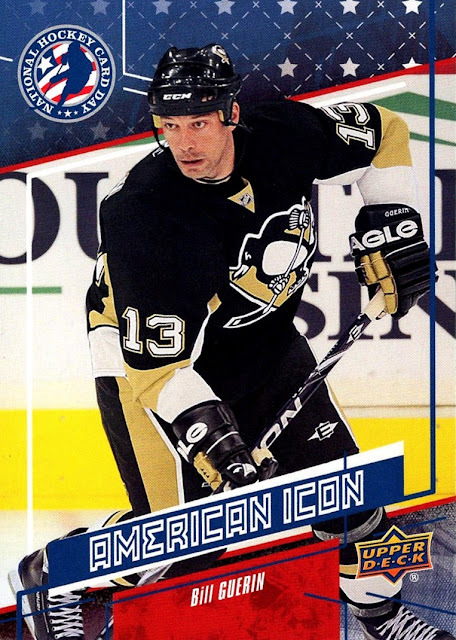 He played 236 games over six seasons, from 97-98 through 2002-03. He played for the Kings, Magic, Nuggets and Mavericks. He was the first French player in NBA history. He's the first player among this group that I got to consider myself a fan of during their playing career. Most retired before I discovered the game- two before I was even born. The first woman to appear on this project, there are not too many to follow her. 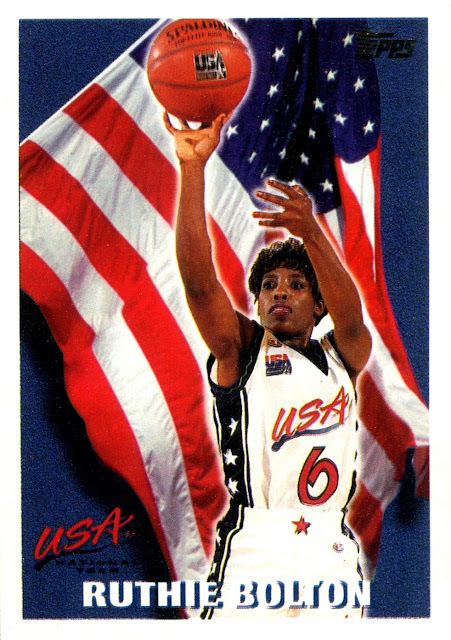 I include Team USA sets in my main collection and the majority of the WNBA players who appear in my NBA collection come from these sets, but 1999-00 Stadium Club also includes the Women's Olympic team and maybe a couple of other sets do as well. She is from Lucedale, Mississippi, and played in two Olympics, winning gold medals in 1996 and 2000. She is also an Army veteran, which I did not know until I researched this post. 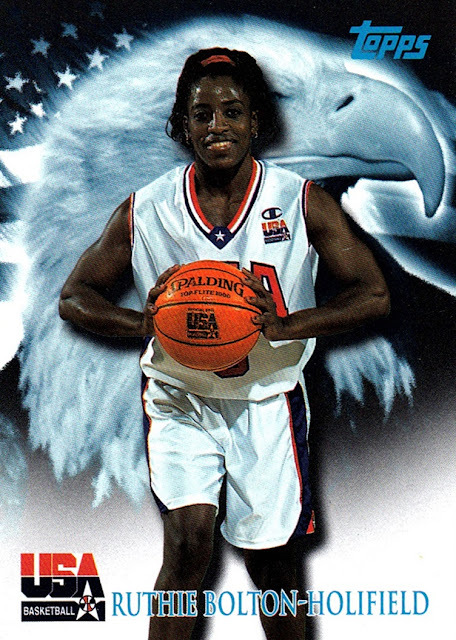 She played 8 years in the WNBA, all for the Sacramento Monarchs, and was an all-star in 1999 and 2001. At one point she had been married to someone named Holifield but no longer is. 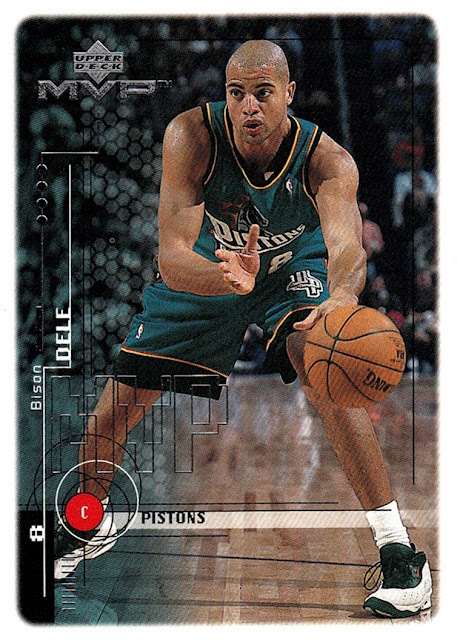 Born Brian Williams but changing his name to Bison Dele before his final NBA season, the story of Williams/Dele is a sad one. It's believed that he was murdered by his own brother, although his brother was adamant he was living in French Polynesia before committing suicide to prevent going to jail for the murder of Dele, Dele's girlfriend and the captain of Dele's sailboat. He played 413 games over 8 seasons in the NBA, (1991-92 though 1998-99) for the Magic, Nuggets, Clippers, Bulls and Pistons. He won a championship with the Bulls in 1996-97. 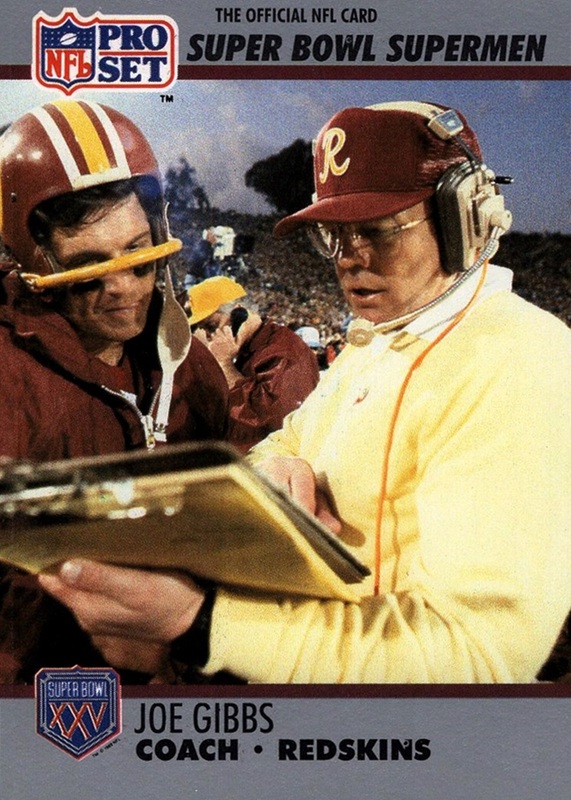 Known as somewhat eccentric, he retired after year #2 of a 5 year contract that was due to pay him several million dollars, I remember at the time it was a perplexing choice that he never explained. His father was a member of the Platters music group. Something a lot of people probably don't know is that Diaw is an abbreviation, his full name is Diaw-Riffiod. 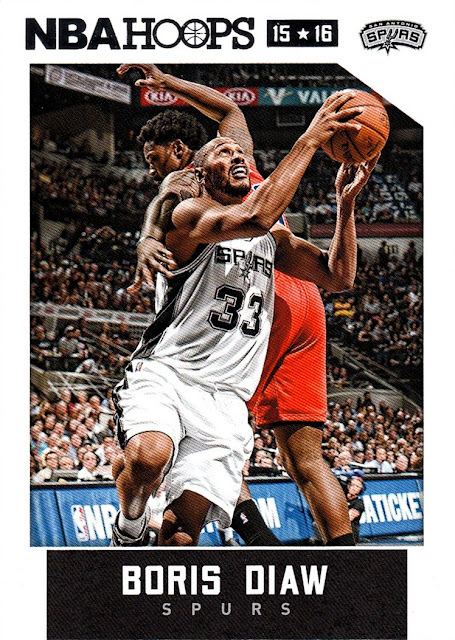 He made the decision in his rookie NBA season to just use Diaw and that is how he is mostly known. Some of his early cards, however, include his full name. 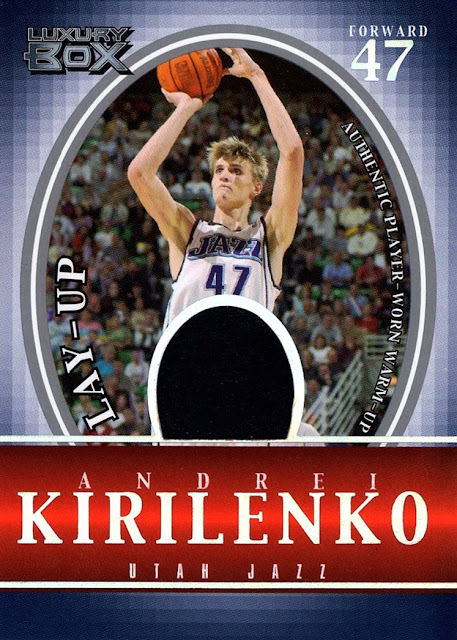 He is currently a member of the Utah Jazz. The native of Cormeille-en-Parisis, France, has previously played for the Hawks, Suns, Bobcats and Spurs, where he won a Championship in 2013-14. He also was named the NBA's Most Improved Player in 2005-06 while a member of the Suns. As of this writing he has appeared in 1039 NBA games. Before coming to the NBA in 2003-04 he played professionally in Europe although those stats are not reflected here. 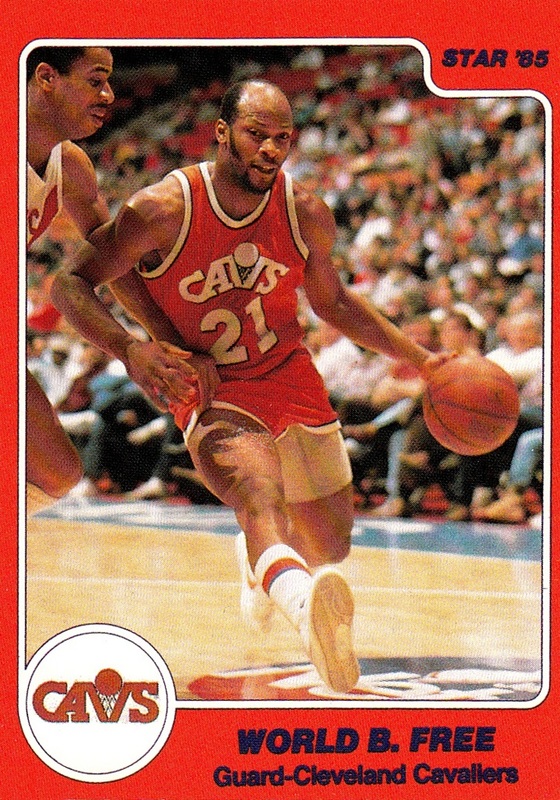 Born Lloyd Free, he was nicknamed All-World while in junior high, and the day before he turned 28, he legally changed his name to World, and with Bernard being his middle name, World B. Free was "born". 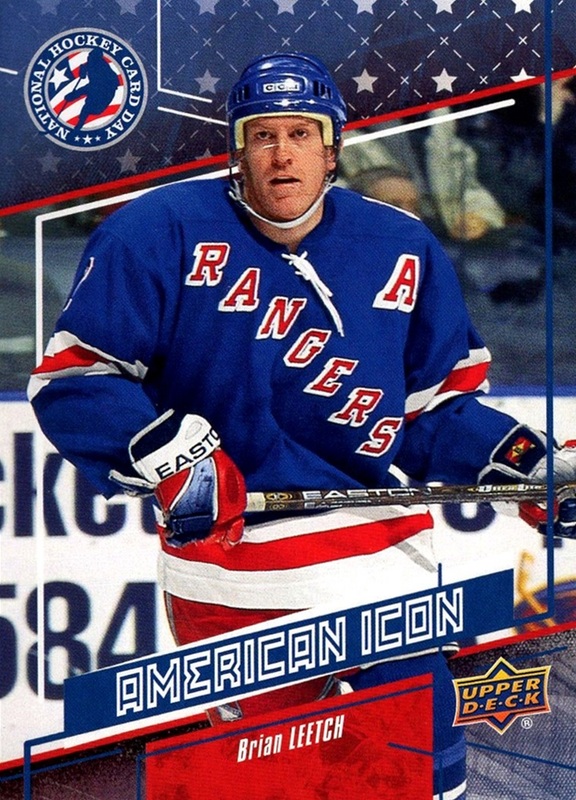 He played 886 games over 13 seasons between 1975-76 and 1987-88. He played for the 76ers, Clippers, Warriors, Cavaliers, Sixers again and Houston. He currently works for the 76ers. 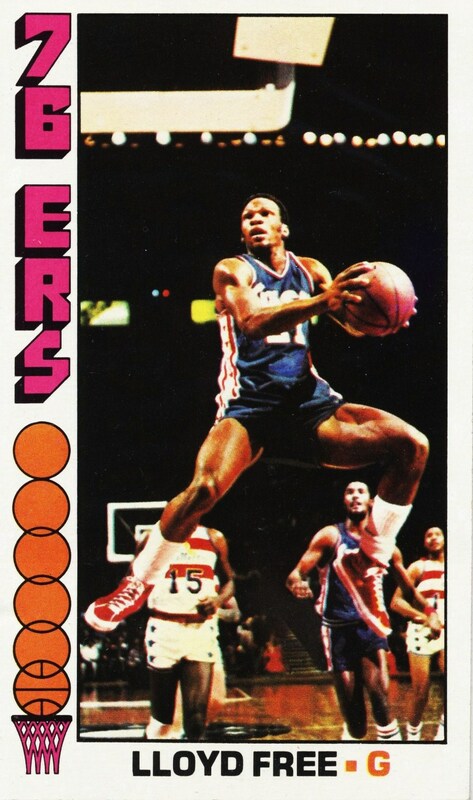 When I first started collecting, and heard there was a player named World B. Free, it was pretty mind blowing, at least to a 12 year old. It would be a few years before I learned he wasn't born with that name, but it doesn't matter. He had already been cemented as a favorite among players I had never gotten to see play. He hails from Atlanta. 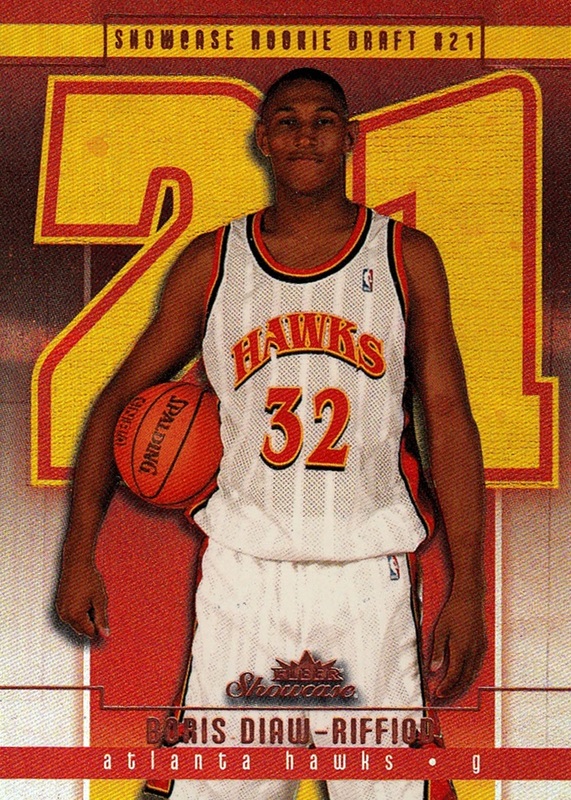 Born Armon Gilliam, he legally changed his name before his final season of 1999-00 because he was tired of people pronouncing it wrong, it was always supposed to be pronounced as "Armen", not "Armon" so he changed it. 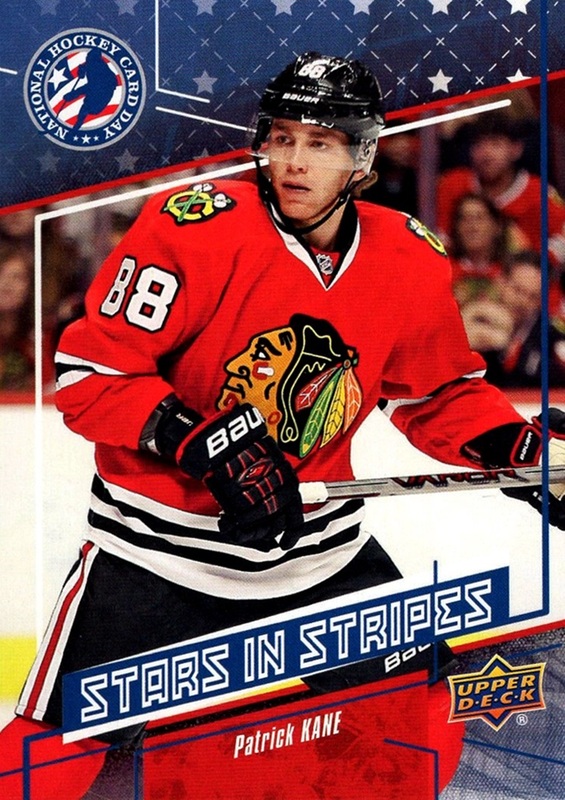 Most places list his 1999-00 cards as UERs but that is in fact incorrect. He played 929 games between 1987-88 and 1999-00 as noted. 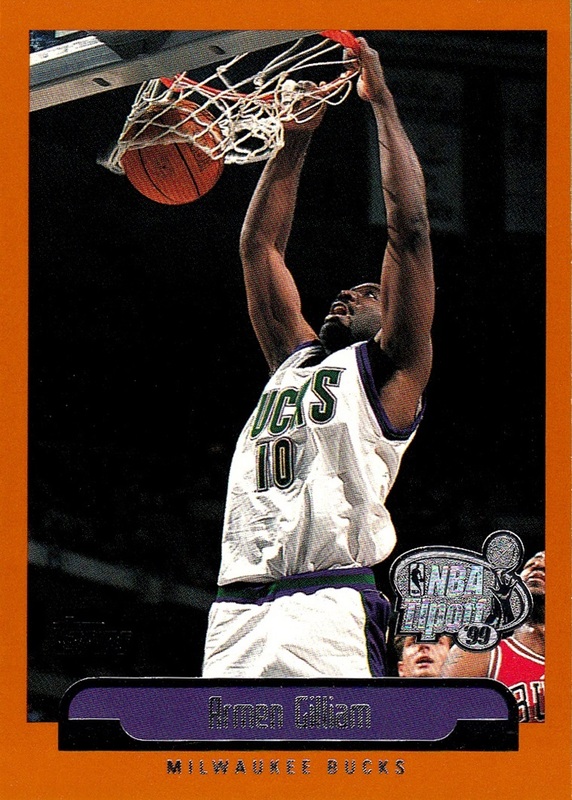 He played for the Suns, Hornets, 76ers, Nets, Bucks and Jazz. Unfortunately, he only lived to 47 years old, felled by a heart attack in 2011. Post #3 returns back to the letter A picking up where I left off after Michael Adams. Some people do all-time team rosters...I do all-time league rosters! I've mentioned in the past that one of my main projects is to have every NBA person who has gotten a card into my collection. While the majority of the cards are of players, there are also coaches, team owners, broadcasters, and even celebrity fans of the game who have gotten cards. As of the time of this writing, 2/21/2017, I have more than 2700 people in my collection. I'm going to take a look through each of them, 10 people at a time, in (mostly) alphabetical order. There are some I have not scanned any cards of yet so they will be pushed off for later. How I reckon my collection: It must be an individual player card. It can't be a team card, a card shared with anyone else, a League Leader card, and no college cards. Multi-sport releases are also not counted for the scope of this project. WNBA players will be included if they were included in one of the Team USA sets or an NBA flagship set. I will write a very brief biography for them which details the length of their career and who they played for. What I can't do, yet, is tell you how many cards I have of each person, because I lost that information to a floppy disk crash in 2005 or so and won't be able to recapture that information until I finish scanning my entire collection, and I did not want to put this project off until then. We begin with the alphabetical first player in NBA History, #1 Alaa Abdelnaby. Alaa Abdelnaby is the only NBA player who was born in Egypt (Cairo), although his family moved to the USA when he was 2. He played in the NBA from 1990-91 through 1994-95, playing for the Blazers, Kings, Bucks, Celtics and 76ers. He played in 256 total games with the majority of them being for the Trail Blazers. He currently is a broadcaster for the Philadelphia 76ers. 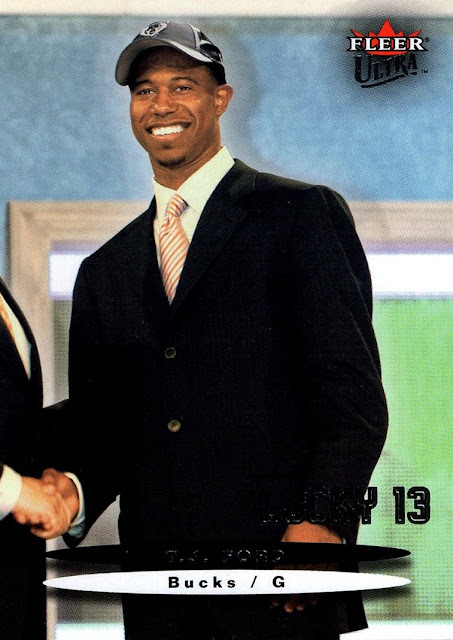 Marietta, Georgia native Shareef Abdur-Rahim was part of the legendary draft class of 1996, and played in the NBA from 1996-97 through 2007-08. 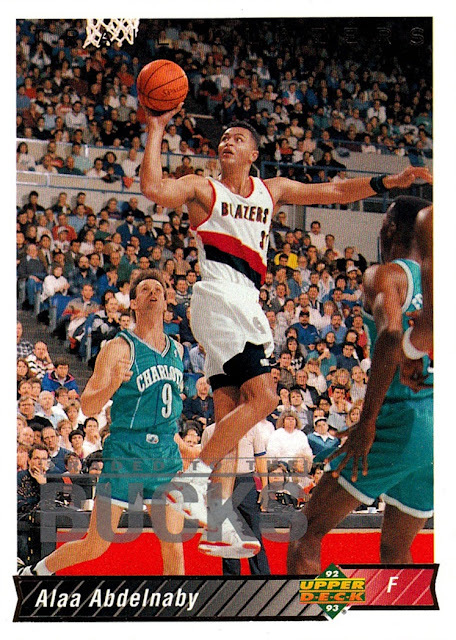 He played for the Vancouver Grizzlies, Hawks, Kings and Trail Blazers. 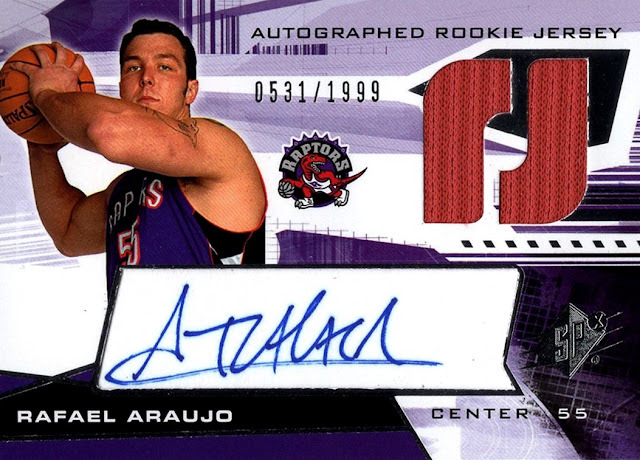 He played 830 games and was an All-Star in 2001-02. He has spent time in the front office for the Kings but as far as I know is no longer a member of that organization. 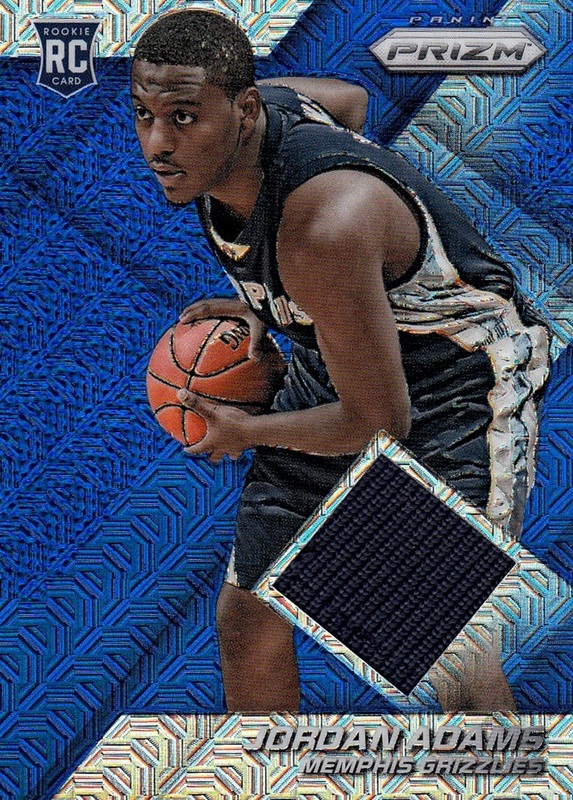 Alex Acker, from Compton, California, is the first player in this project who has only one card in my collection. 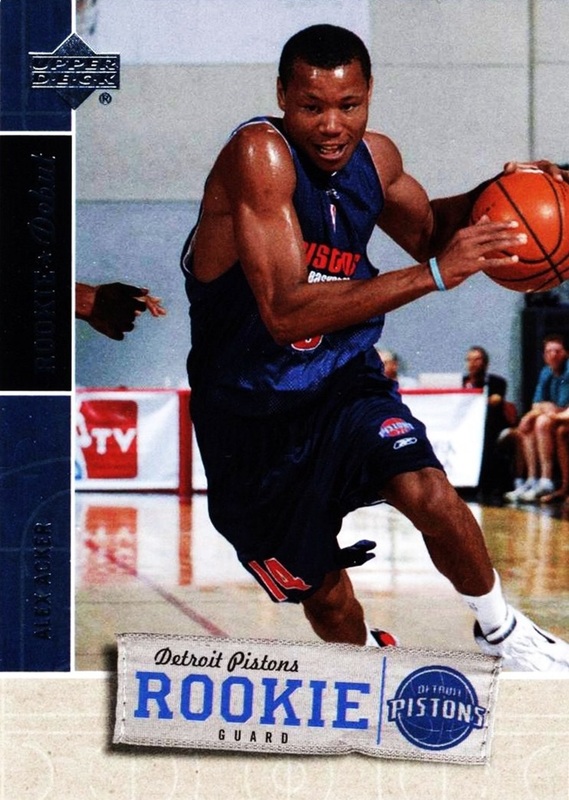 He appeared in only 30 NBA games, for the Detroit Pistons and LA Clippers. He played two years in the NBA, 2005-06 and 2008-09. 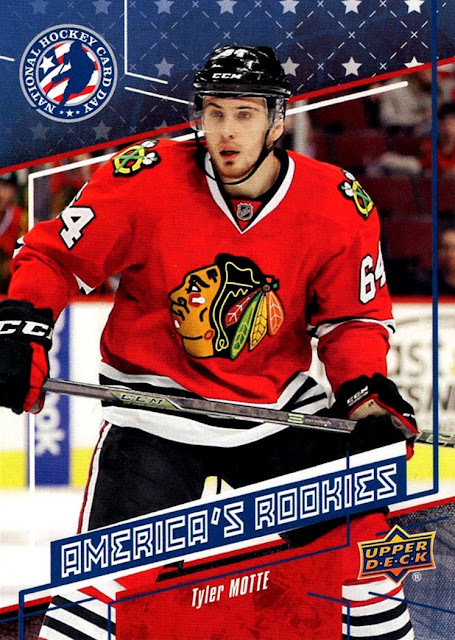 The photo on this card is from the Summer League. 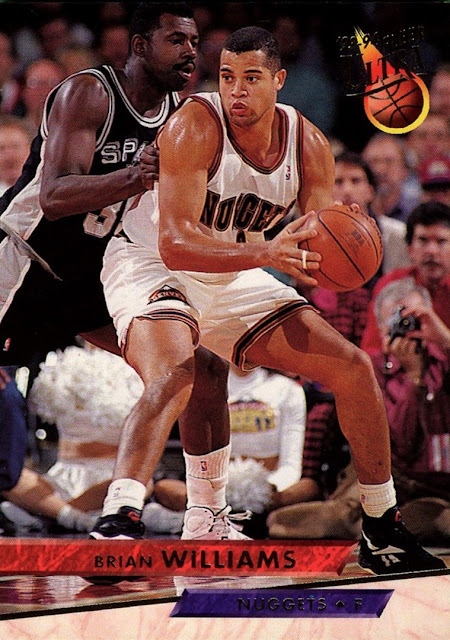 Mark Acres played six years in the NBA, from 1987-88 through 1992-93, playing for the Celtics, Magic, Rockets and Bullets. He was one of the players taken by the Magic in their expansion draft. He hails from Inglewood California, making every player in this post so far have ties to California, either being born there or playing there. Acres played 375 games. 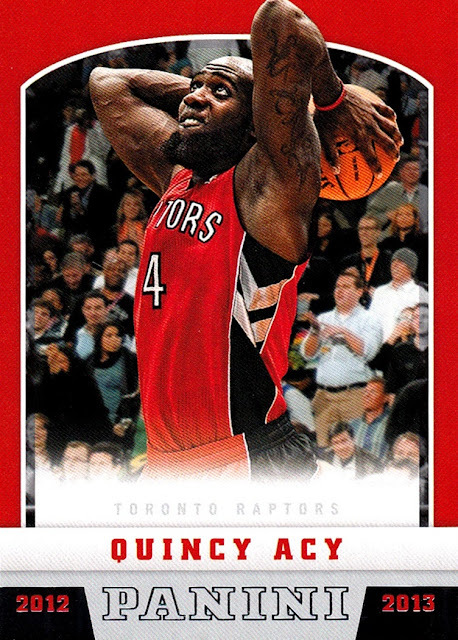 Quincy Acy is the first player who is still in the NBA, currently a member of the Brooklyn Nets. (he does not have a card with the Nets as of yet). As of this writing he has played 237 NBA games, with the Raptors, Kings, Knicks, Kings again, Mavericks and now, as noted, the Nets. He has been in the NBA since 2012-13. Acy is from Tyler, Texas. 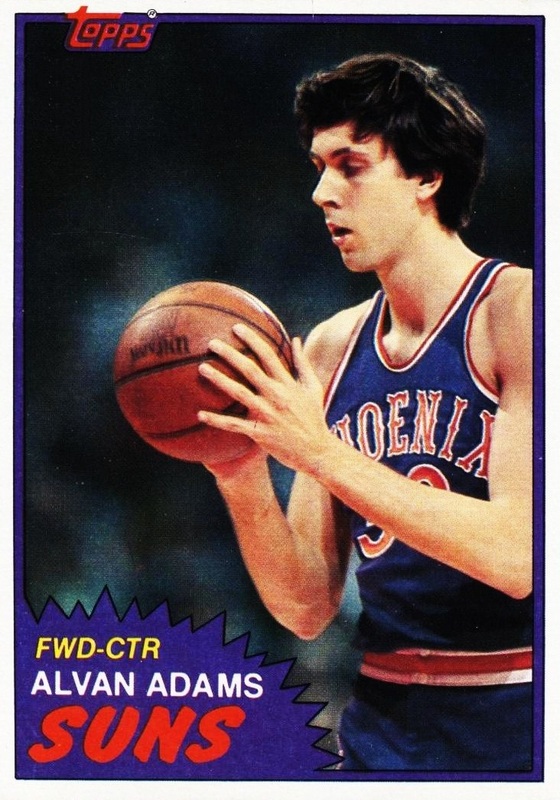 Career Sun Alvan Adams played 988 games in the NBA from 1975-76 through 1987-88, made the All-Star Game his rookie year and later took home Rookie of the Year honors that same season. The Lawrence, Kansas native is the first player to not have any ties to California. 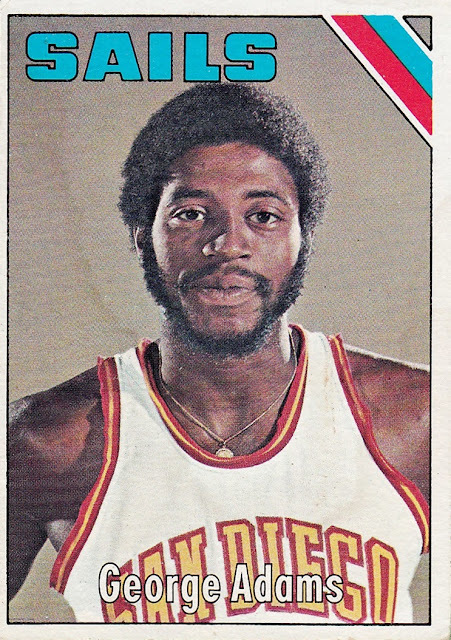 George Adams, of Kings Mountain, North Carolina, played his entire three year career with the San Diego Sails of the ABA. He played 215 games from 1972-73 through 1974-75. 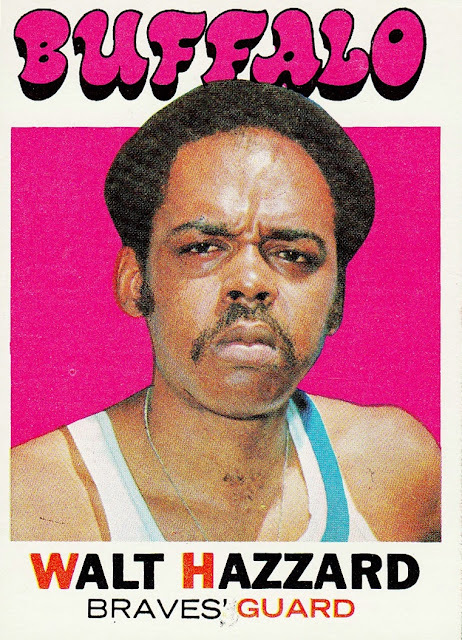 He is the first ABA only player to appear in this project, but the ABA players are included as the NBA absorbed the ABA. Hassan Adams played 73 games over two seasons in the NBA, one with the Nets and one with the Raptors, in 2006-07 and 2008-09. This is my only card of him and unfortunately it does not depict him in the NBA. He is also from Inglewood, California. Jordan Adams played 32 games over two years with the Memphis Grizzlies, 30 of which during his rookie year of 2014-15, but a recurring knee injury appears to have ended his career before it even really began. He has not played ball-in the NBA or elsewhere-since a major knee surgery after two games of the 2015-16 season. 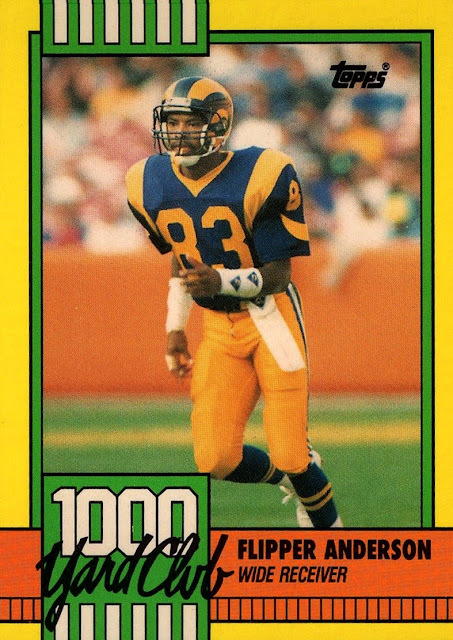 He is from Atlanta, Georgia and is yet another player with a California tie-he attended UCLA. 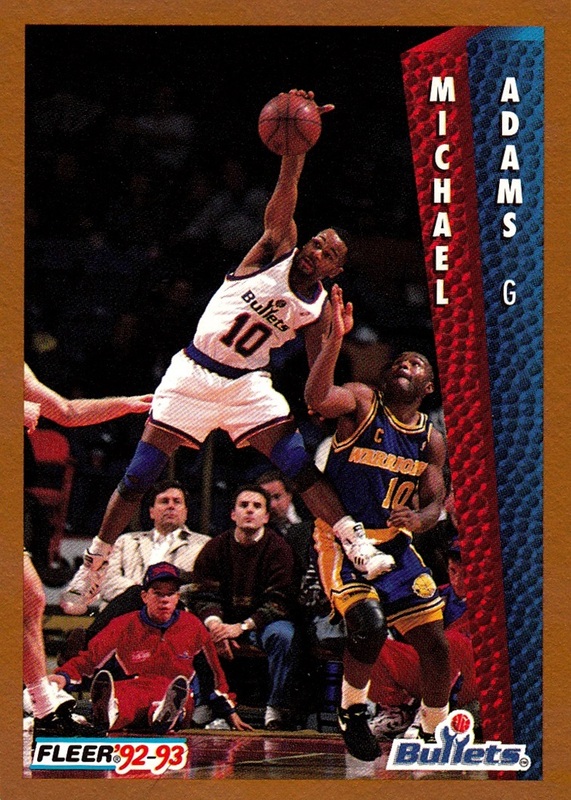 Michael Adams, of Hartford, Connecticut, played 653 games over 11 NBA seasons. He played for the Kings, Bullets (twice), Nuggets and Hornets. Although I mostly associate him with the Bullets, due to being who most of his cards are with, he played the most games for the Nuggets, being their starting point guard from 1987-91. 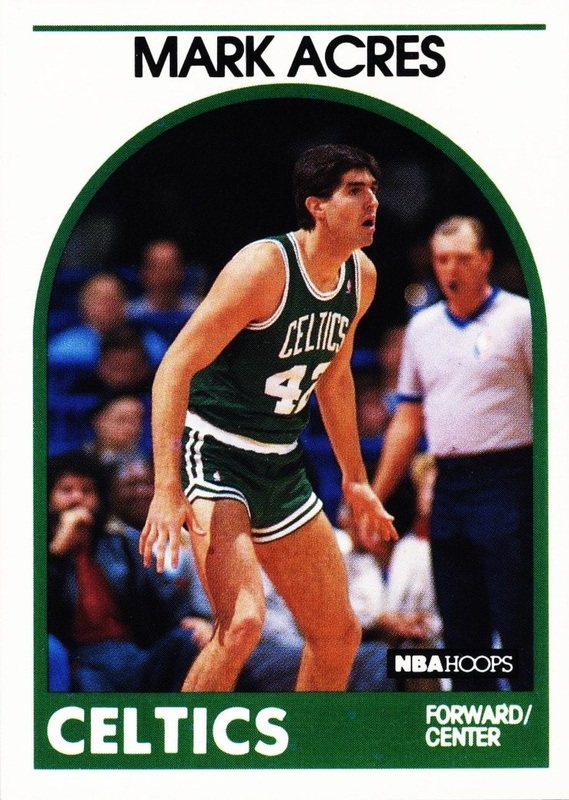 He played from 1985-86 through 1995-96, and stood only 5 foot 10. He was an All-Star in 1991-92. And that's the first ten! Stay tuned for future posts, as I document from Abdelnaby to Zwikker. Yesterday, Tony at Off Hiatus Baseball Cards put up a post talking about the 1954 Topps Scoop set, which I enjoyed as it's my all-time favorite non-sport set. Yet in the comments, several regular readers/commenters of mine said they had never seen the set before. Even though I've posted about it multiple times. Here's the tag I have for it, though it does not cover every post as in some cases I've run out of space in the tag section and listed the card subject instead of the set, usually the first thing I bump for lack of space. 1954 Topps Scoop. I've written a couple more that remain in my queue as well. This kind of threw me into a bit of a funk, I saw this not long before bed and I stewed on it the rest of the night and this morning. I've not been in a good mood lately anyway and it really makes me wonder why I even post things, sometimes it seems like a fool's errand; to be honest. I've always said I do it for myself first and foremost but I also want to get knowledge out there, expose people to cards that I enjoy and I think they might enjoy as well. Maybe the people I thought were regular readers of mine aren't. Maybe the views I'm seeing on my dashboard are simply my refreshing the page hoping to get a comment that will never come. Maybe I'm wasting my time by doing this. I know that in reality I get more comments than most card bloggers...that's just the insecurity in my head I suppose. I'd like to think that's not the case, and I know that I miss posts from blogs that I am a regular reader of. Maybe it's some cosmic joke that one of my favorite sets to post about happens to be the blog posts that everyone misses. It could happen. I like to think that by doing this my knowledge will survive beyond me. 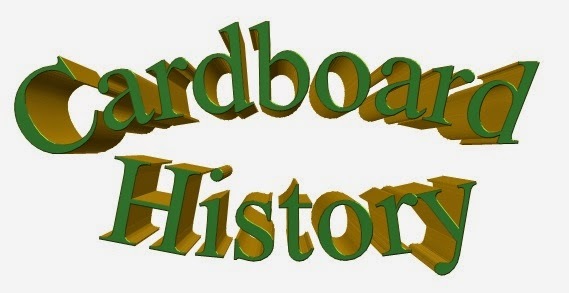 I have years of random card trivia in my head that while is not necessarily exclusive to me, my writing of it is. Hopefully by putting it up on Google, owners of Blogger, it will survive for years to come. I can't guarantee that of course...but if I don't get it down on "paper", it wouldn't even have the chance to survive. I want to make clear, I am not mad at the bloggers who commented on Tony's post. It just made me wonder if I am banging my head on the proverbial wall or if there is actually some benefit to doing this beyond the simple enjoyment of it. I know that the posts I put the most effort into, the ones I am most proud of, tend to be my least popular. Like I said, cosmic joke. And that brings me to another topic that I've been pondering. It's about memory. Mine is terrible, as I've noted several times. But I have some great memories of the time period 1988-98. Yet while they may be things I think back on and remember fondly, they really don't matter to anyone else, and since I am not really eloquent enough to properly describe them, they reside in my head alone, and have a finite lifespan. As I read through Archaeology magazine (my favorite) I think about the fact that we know nothing about the people who they are digging up. What was their personality like? What memories made them smile? What was their name? What did they enjoy doing? What had they seen in their lives? What did their voice sound like? We usually don't know...and we have know way of knowing, ever. That's depressing, really. We know the important events for more than 5000 years of human history, but we really don't know the people themselves. What we usually CAN figure out is why they died. That's their only historical notation for most people. 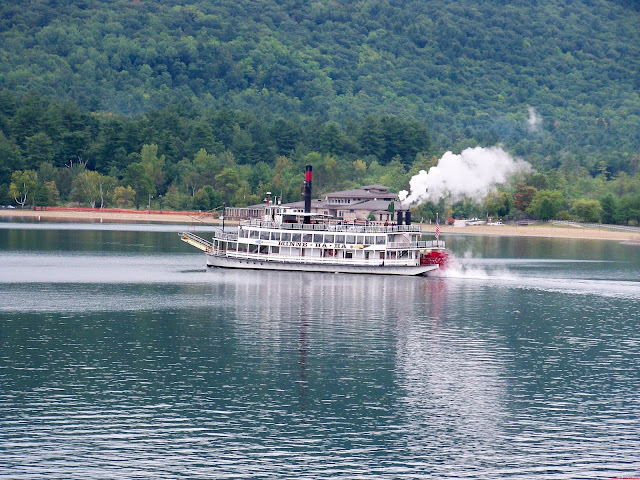 My best memories are of going to Lake George, waking up in the morning and looking out at the water while I ate breakfast, seeing it glint off the sun as the waves moved, seeing the array of boats large and small, the seagulls flying, the leaves blowing softly in the breeze, the slow chugging of the Minne-Ha-Ha's paddle wheel propelling her up and down the lake, echoing off the mountains followed by her steam calliope. That's all gone now. There's no way to really capture it on film, although I have hundreds if not thousands of photos and videos trying. We can't go back to the place where the memories were made, after going there every year- usually more than once a year- from 1987-2012. We still talk about a family trip in 1997 that was only 4 days, yet we crammed in as much as we normally did in our week+ stays. That's another fond memory that is shared by only three people...nobody even knows it existed besides us so nobody else could even remember it. And my terrible memory means most of the details are lost to me. I remember that it was a 4 day trip, it was a lot of fun, and that we did a lot of stuff, but the actual "stuff" that we did...that's lost to me. And as time goes on I'm losing more and more and it's very frustrating. I can look through our family photos, clearly see myself in some place, doing something...and yet have no memory of it, weather it be the 1990s, 2000s or even just last year. As I've said that's one of the reasons I began this blog. I wanted to get things written before the memory disappeared. It's worked well. For some reason my collections are something I have been able to remember more details on than other things. I don't know why that is; it's just how my mind works, I suppose. But even that is not as good as it once was...and how I think of it being. My 1/64 NASCAR collection used be #1, especially the Racing Champions section. Yet when I finally created a paper listing and integrated them into my collection proper just last month, I made many mistakes because I simply couldn't remember what was what. That bothered me more than I let on at the time, but I chalked it up to the immense amount of pain I was in...but I don't think it was caused by that at all. I think it's just...me. What I'm getting at in my usual round-about manner is that I hope by writing this blog, and my other rarely updated blogs, is that I hope that I at least leave some small footprint on history. I am considering starting two new blogs- one for my automotive photography, and one for my nature photography. But I have put it off so far due to the fact that I rarely ever update my other collection blogs that I know it might not even be worth my effort. I currently have all my photography on my website but unlike Blogger, which is free, my website is something I pay for...and when I am no longer able to pay for it, it will be gone forever. Here's a favorite photo I've taken. Of course, I'm well familiar with computers crashing, corrupting and losing things- I'm on computer #3, I'm in a multi-year project of recreating my collection files due to them being lost in a floppy disk crash, my remote hard drive fried less than a year ago taking months worth of work, etc. So I am well aware that all I am doing could disappear in an instant and I would have no control over it. But I can't just give up and not do it, either. I'm sorry to have another "existential crisis" post, and another with no actual card scans in it. I will try and get back to normal card posts next time. My first National Hockey Card Day! Editorial note: The first part of this post is a copy and paste from my post on A Pack to Be Named Later. 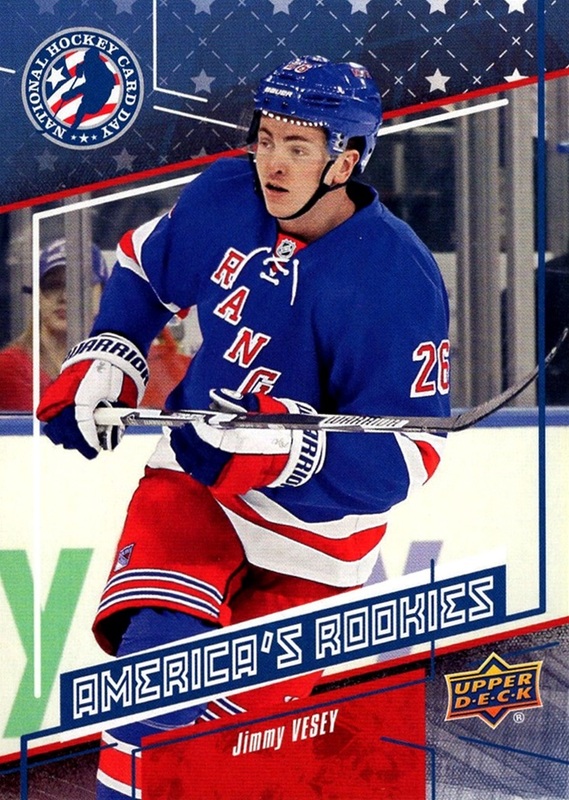 The new material starts after the Auston Matthews card. Today, February 18th, 2017 is National Hockey Card Day in both the USA and Canada. How it works is, if you visit a participating hobby shop, you get some free hockey cards. Pretty simple, no? 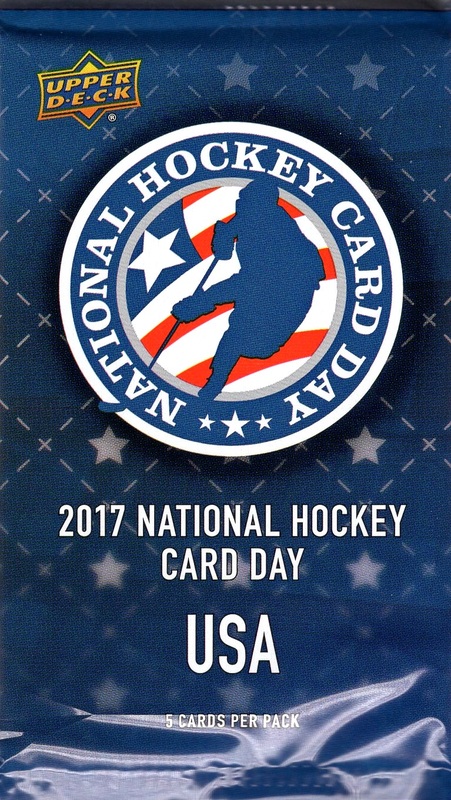 They've been doing it since 2009 in Canada and 2012 in the USA, but since I just began to collect hockey, this is my first one participating. I'm not sure how big a deal it is, but I didn't roll into my local shop until 3 PM and I was the first one to ask for them. Hopefully it will continue because let's face it, all card collectors love oddball issues. I was afraid they were going to be all sold out-even more so when I discovered that somebody had come in and purchased just about every hockey box in the shop since my last visit a month ago-but I was lucky. 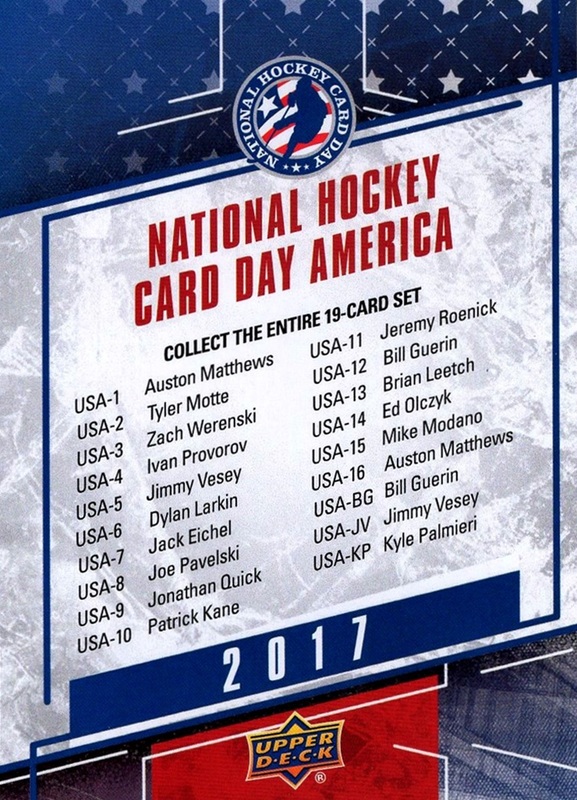 The set primarily includes American born players on American teams, but the Toronto Maple Leafs make an appearance with Auston Matthews being both card #1 in the set, and a special bonus card #16 that usually only comes with a purchase of UD cards, but since I've been a regular at my shop for 17 years, and they had no more hockey cards to purchase, I got one of them too. The set is not just current players, there are retired legends as well. There are also some super rare autographs as well but I was not lucky enough to pull any of them. One thing to watch out for, about half the cards I pulled had damage on the back, this was something done at the UD factory, because of the fact that the cards underneath them did not always have damage. 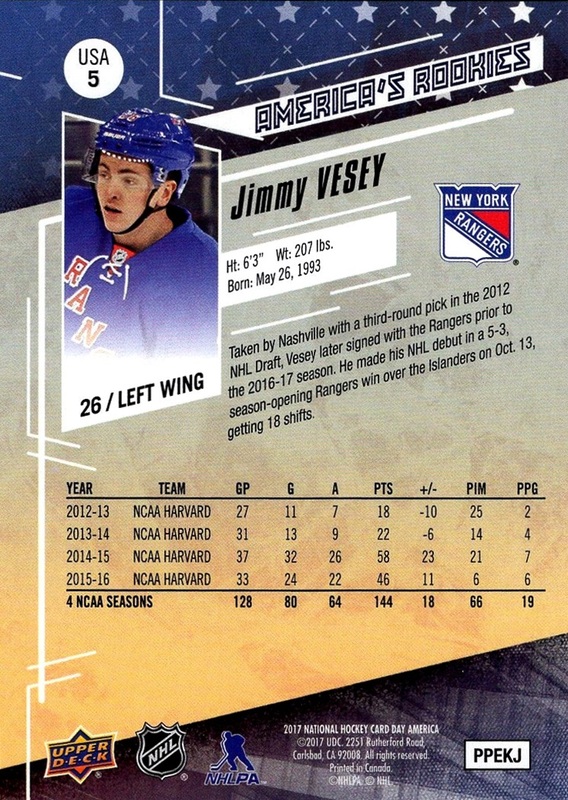 First out of my first pack was Jimmy Vesey, a rookie on the New York Rangers. Following him was Bill Guerin, one of the legends in the set. 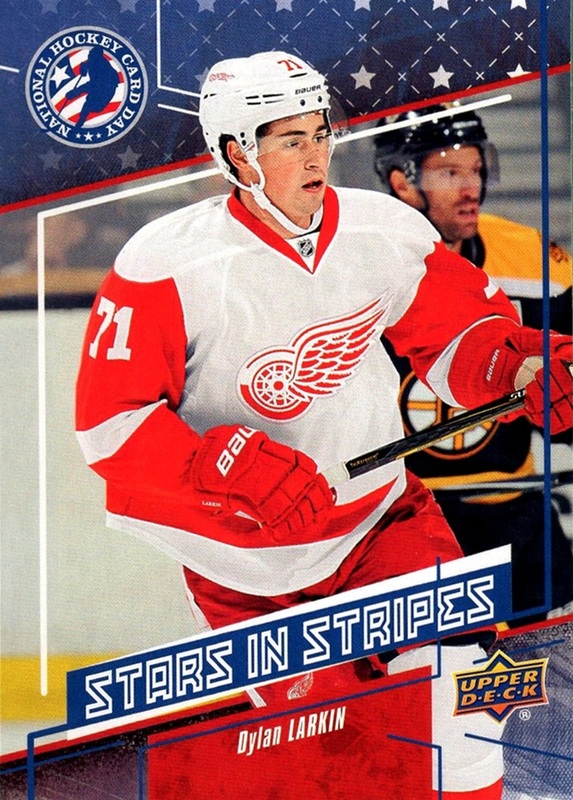 Dylan Larkin came next...and appeared in my second pack as well. I know it's a small set at only 15 base cards, but a duplicate is still a bit disappointing. Although not counted as part of the pack, each pack I opened also included a checklist card, which is great. I love checklists. Here's the back of the regular cards. The one thing I would have done differently was include the player's hometown. After all, the set is built around American hockey players, so it would have been nice info to include. 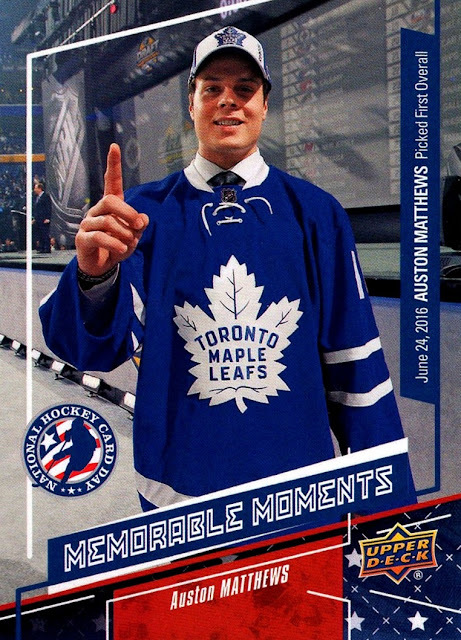 As an added bonus, here is the Auston Matthews bonus card that doesn't come in a pack. It is my first official hockey card of him, as he previously only appeared in my multi-sport collection. My first cards of Vesey and Werenski as well! Now, here's pack two...minus the spare Larkin of course. Now, I went to the shop with the intention of buying another tin of 2015-16 Series 2, which I got one of last month and when I left they had 4 more on the shelves. They were gone, as was pretty much everything else. As I mentioned they sold most of the hockey in the store. But I did not come away empty handed. I have been a big fan of my local shop since I started going there in the year 2000. But the one bad thing is that they didn't do single cards...only boxes. That has now changed. I was able to add some singles to my NBA collection. Although I've been posting about hockey more than NBA recently, NBA is still #1 for me...I wasn't sure if these were all new or not, but I decided to take the chance on a couple I wasn't sure about, because I figured, even if not new, they were still serially numbered, and I've got a serious SN addiction. I've been finding a lot of Araujo autographs for cheap recently, this is the third I've added for $5 or less in the last year. This is my second card from this relic set. The first one I got when I did a box when the set was new back in 2005. This is one I wasn't sure if I needed or not. 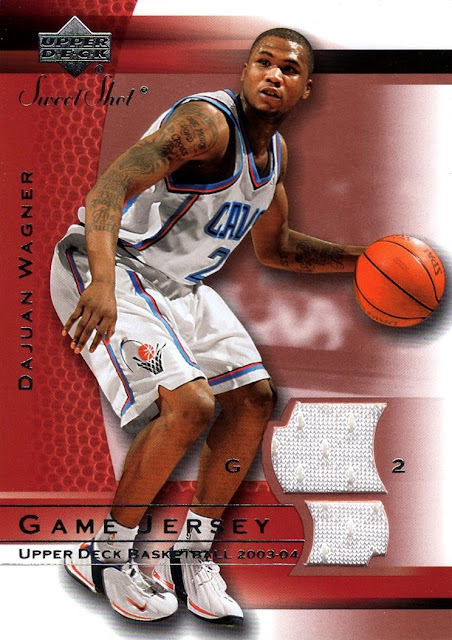 I've written about Dajuan Wagner before. Had great talent but poor health. I've always felt bad for Lampe. He was a player similar to Kristaps Porzingis, but he never got the chance to get on the court to show what he could do. 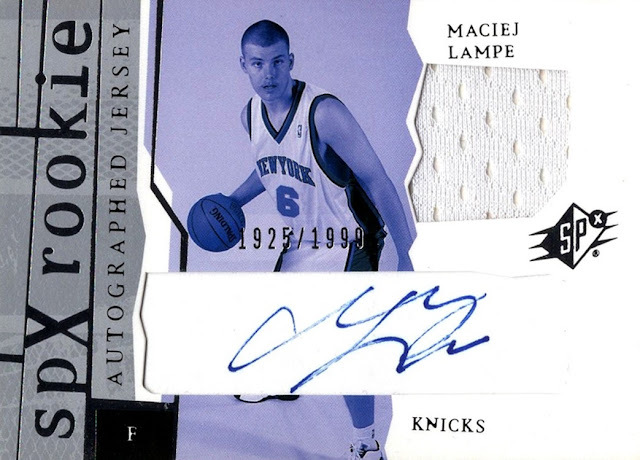 He even wore #6 on the Knicks...Lampe was expected to be a lottery pick, but fell to the 30th pick in the draft...the New York fans actually cheered for him, he was there at the draft. (Highly ususual, the NY fans boo everybody). But...the Knicks, at that time, refused to play rookies. He sat on the bench without getting a chance to play. Not even a single game did the Knicks bother to play him. Then, he was traded to the Suns in the Penny Hardaway/Stephon Marbury trade. The Suns finally did play him...barely. 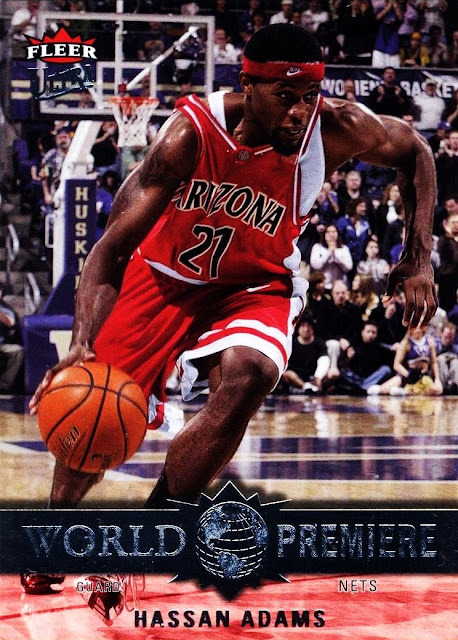 He got into 37 games over two years for the Suns, before they traded him to the Hornets where he again mostly benchwarmed, before they traded him to the Rockets, who played him in a grand total 12 minutes over 4 games, before releasing him. He never played in the NBA again. We have no real clue what he could have accomplished because his coaches never bothered to find out. I've always felt bad for him, like I said. According to Wikipedia, he's playing in China now. Finally we have TJ Ford from 2003-04 Ultra. I really liked this Ultra design, but I didn't like that the lottery picks were short printed. (Each of the Lucky 13 is SN500 on the back). I have most of them but I didn't know if I had this one, so I took the chance. Turns out I needed it! 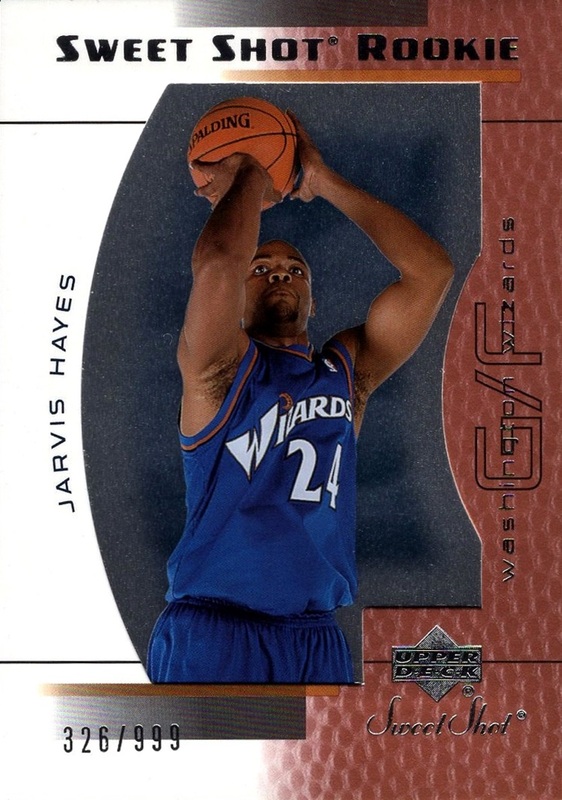 In fact, I only guessed wrong once, the only card I had before was the Jarvis Hayes from Sweet Shot. Not too bad considering. Commishioning a post for my oldest card!